Once you register an account on one of the websites, connect to the XMPP server using the account on the Psi client. We will be using the following account: green@tigase.im which is this guide. When you are ready right click on the account name in Psi roster window to bring up context menu. Select Service Discovery element. A new windows pops up as in the example on the right. 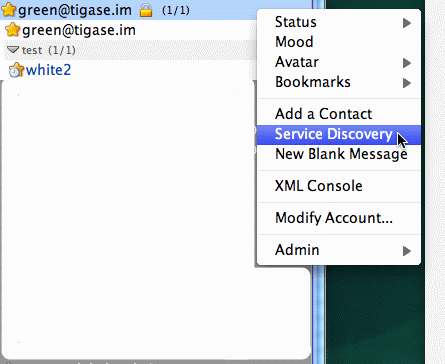 The service discovery window is where all the stuff installed on XMPP service should show up. Most of elements on the list are well known transports, MUC and PubSub components. The new stuff on the list, which we are interested in, are 2 elements: VHost Manager and Session Manager. 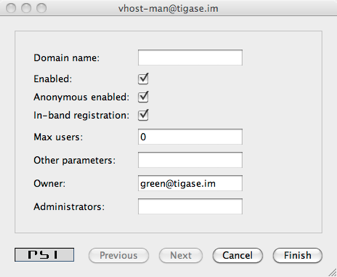 VHost Manager component in Tigase is responsible for managing and controlling virtual hosts on the installation. It provides virtual hosts information to all other parts of the system and also allows you to add new hosts and remove/update existing virtual hosts. 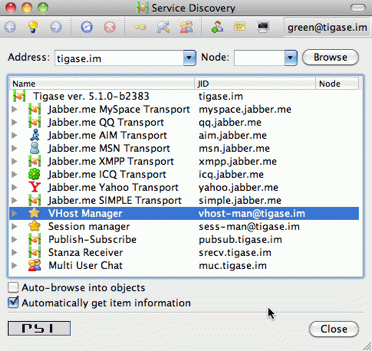 Session Manager component in Tigase is responsible for managing users. In most cases online users but it can also perform some actions on user repository where all user data is stored. Select VHost Manager and double click on it. A new windows shows up (might be hidden behind the service discovery window). The window contains another menu with a few items: Add…​, Remove…​ and Update…​ . These are for adding, removing and updating VHost information. For now, just select the first element Add…​. Click Execute and you get a new window where you can enter all of your VHost configuration details. All fields should be self explanatory. Leave a blank field for Other parameters for now. Owner is you, that is Jabber ID which controls the domain and can change the domain configuration settings or can remove the domain from the service. Administrators field can be left blank or can contain comma separated list of Jabber IDs for people who can manage users within the domain. You do not need to add your user name to the list as Owners can always manage users for the domain. When you are ready click the Finish button. All done, hopefully. You can get either a window confirming everything went well or a window printing an error message if something went wrong. What can be wrong? There are some restrictions I decided to put on the service to prevent abuse. One of the restrictions is the maximum number of domains a user can register for himself which is 25 right now. Another restriction is that the domain which you add must have a valid DNS entry pointing to our service. The XMPP guide describes all the details about DNS settings. Please refer to these instructions if you need more details.